Daan Slooter, mellow personality, golf reporter, director of the KLM Open, once a promising talent himself, played for the national golf team for ten years. His best round was 69 of the back tees on his home course. ​Mister KLM Open even has a trail named for him, at the Noordwijk Golf Club. 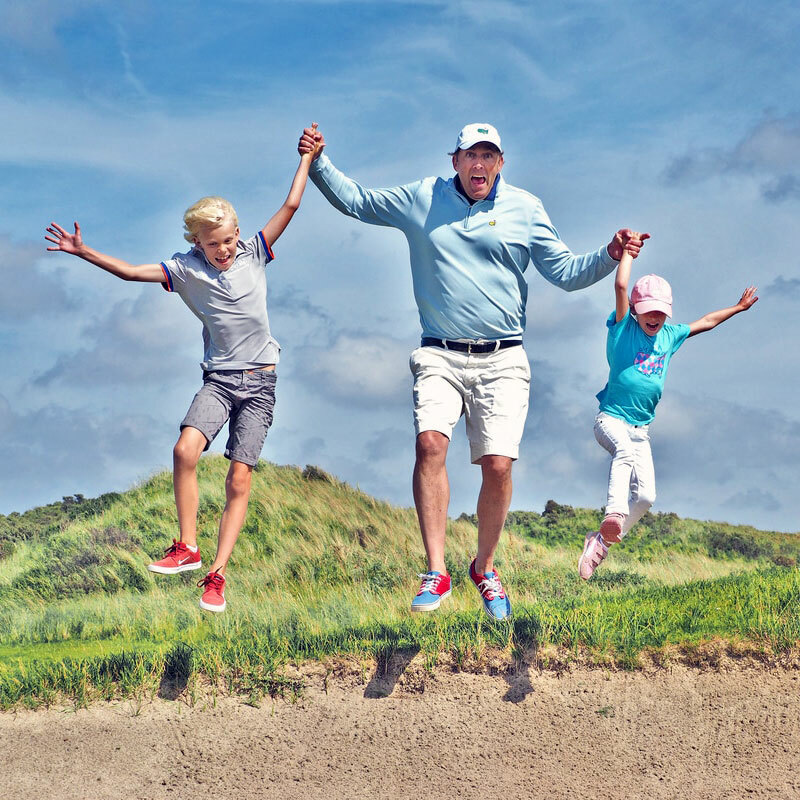 Despite having met a large number of golf icons and heroes, his real heroes are his son Rein and daughter Veerle. They love jumping in and out of the bunker together. ​Love bunkers! They are such a challenge. Maybe that’s why I excel at bunker shots. 2. What is the great thing about golf? ​Golf is the ultimate battle with oneself, constantly setting goals, testing yourself plus being outdoors. Interacting with others as well as being by yourself, seeing the most beautiful spots on earth. A sports that builds character. Golf is a gentleman’s game. The fun is a big part of it as well. The sheer delight of landing a ball in the hole from an almost impossible position, totally infuriating your opponent. I have fond memories of the times when I was rolling on the floor, roaring with laughter to the point where it was impossible to hit a ball. 3. Which is your favorite hole at your home course? ​I should say the seventh hole because that’s where the Daan Slooter trail is located but actually I choose the sixteenth of Noordwijk. No bunker but a tricky hole when it’s windy. 4. Best golfer in the world and why? 5. How does it feel seeing Joost Luiten win the KLM Open twice? ​Strangely enough, a tournament director is not much aware of how the tournament progresses. But of course I was present at the thrilling play-off on the Kennemer in 2013 with Miguel Angel Jiménez. Absolutely awesome. ​Last year was our debut on The Dutch and what a wonderful edition it was. The course looked beautiful, the weather was great and we had a large amount of visitors. Hopefully this year will be the same. Of course Beat the Pro will be part of this year’s program again. 7. Have you ever aspired to having a professional career? ​Becoming a pro is not the hardest part, being successful is the trick. Back in those days there was not a lot of prize money to go around. Only the top 30 golfers of Europe could make a living out of it. But if I could go back in time, I would pay more attention to the physical aspects of golf. Maybe I could have had a splendid career, but seriously, no regrets. However, I have been so lucky as to have hit five holes-in-one. Feeling really fortunate because it is more than Ballesteros and Bernhard Langer have between them. I hit my first when I was thirteen and the second at fourteen. I thought I would land one every year. That’s not how it worked, though. I am now up to five. 8. ​With whom would you like to hit out of the bunker? ​Preferably with my children. I have met all of my golf heroes, which was wonderful and of great value. Yet, no idol can beat the experience with my own kids. My kids are my real heroes. Sometimes I secretly bring my eight-year-old son Rein along to the course to play together. Rein likes golf but he is an avid soccer player as well. He is a goalgetter with VV Noordwijk. 9. Why do kids need to learn to play golf? ​Golf teaches creativity, honesty and good manners. You can enjoy playing it your whole life. 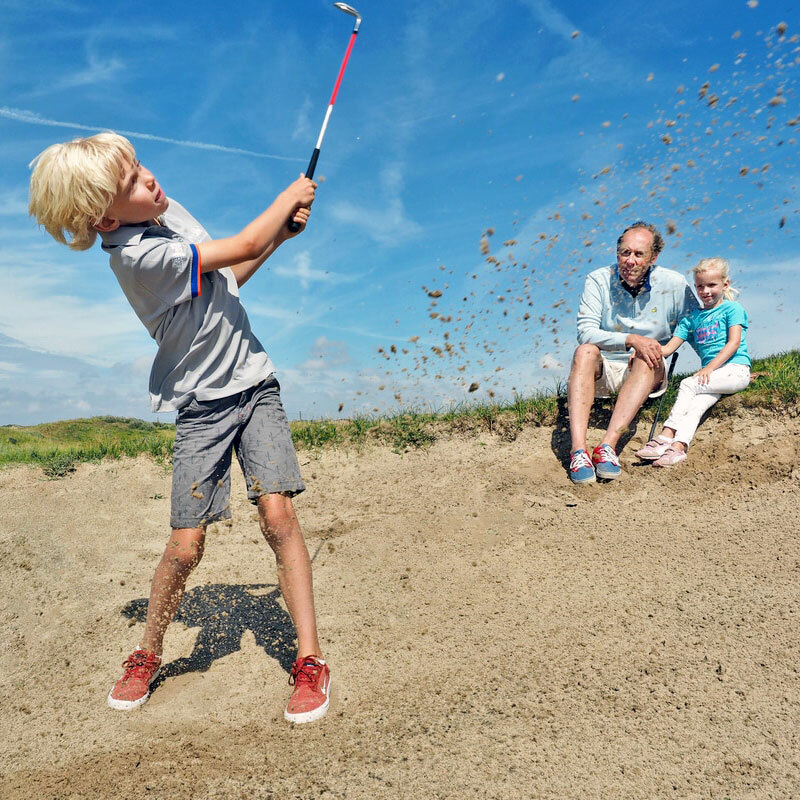 ​Parents can play golf with their children despite the differences in skills, which is why it is such a sociable sport and a great family activity. Golfing with friends is like having a party. You will meet wonderful people through golf while being outdoors all the time.